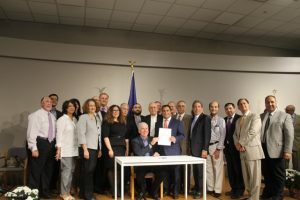 The governors of Michigan and Rhode Island signed into law bills mandating Holocaust and genocide education. Michigan’s law, signed on June 27th, requires that “…social studies curriculum for grades 8 to 12 includes age- and grade-appropriate instruction about genocide, including, but not limited to, the Holocaust and the Armenian Genocide.” It mandates at least 6 hours of instruction on the topic. The Genocide Education Project has created curriculum for Rhode Island schools, including a 12-minute classroom documentary on the Armenian Genocide and Rhode Island Armenian-Americans, a community built by genocide survivors. The film, “A Journey from Despair to Hope”, tells the story of Margaret Garabedian Der Manuelian, told through the narrative voice of her great-granddaughter, 21 year old Dalita Getzoyan. Getzoyan’s mother, Rhode Island educator, Pauline Getzoyan, is GenEd’s Rhode Island branch co-director. Funded by the Rhode Island Council for the Humanities, “A Journey from Despair to Hope” is accompanied by a resource guide for teachers to build a classroom assignment related to the film. Both the Michigan and Rhode Island laws direct a commission of 15 be appointed by the governor to plan and oversee implementation of the curriculum. The German government passed a resolution recognizing the Armenian Genocide, encouraging Turkey to accept it, and also recognizing Germany’s role in it. The resolution has particular significance in Germany, because at the time of the genocide in WWI, Germany was allied with the Turkish-led Ottoman Empire, fighting against Britain, France and Russia, and Germany provided the Turks military and infrastructure guidance and aid which helped carry out the genocide. The Turkish government, which continues to heavily promote a policy of denial, denounced the vote. An estimated three million people of German descent reside in Turkey, including the leader of the Green Party, Cem Ozdemir, a driving force behind the passage of the resolution. 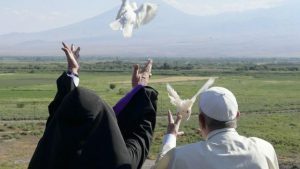 Visiting Armenia for the first time, Pope Francis reaffirmed his recognition of the Armenian Genocide, saying the world should never forget it, laying flowers at the national memorial and writing in the guest book, “Memory should never be watered-down or forgotten” and “memory is the source of peace and the future.” The Vatican has also opened its archive and provided access to secret documents detailing what the church knew and how it tried to intervene. The government of Turkey called the Pope’s actions “very unfortunate,” according to the associated press. When Francis last commemorated the Armenian Genocide in Rome in April 2015, Turkey recalled its ambassador to the Vatican for 10 months.